The Brazilian flag, besides the Mercosul flag, flying at half-staff in front of the National Congress of Brazil in memory of the victims of the Chapecoense crash in 29 November 2016. 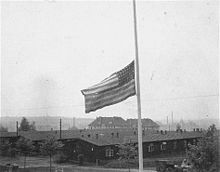 The American flag flying at half-staff in Buchenwald, Thuringia, Germany, on 19 April 1945 following the death of President Roosevelt. The tradition of flying the flag at half-staff began in the 17th century. According to some sources, the flag is lowered to make room for an "invisible flag of death" flying above. However, there is disagreement about where on a flagpole a flag should be when it is at half-staff. It is often recommended that a flag at half-staff be lowered only as much as the hoist, or width, of the flag. British flag protocol is that a flag should be flown no less than two-thirds of the way up the flagpole, with at least the height of the flag between the top of the flag and the top of the pole. It is common for the phrase to be taken literally and for a flag to be flown only halfway up a flagpole, although some authorities deprecate that practice. When hoisting a flag that is to be displayed at half-staff, it should be raised to the finial of the pole for an instant, then lowered to half-staff. Likewise, when the flag is lowered at the end of the day, it should be hoisted to the finial for an instant, and then lowered. The Australian White Ensign flying at half-mast. In accordance with British tradition, the flag is flying only one flag's width below the top of the pole. On the death of a distinguished Australian citizen. Flags in any locality may be flown at half-mast on the death of a notable local citizen or on the day, or part of the day, of their funeral. Recent examples include the death of naturalist Steve Irwin, actor Heath Ledger, esteemed international opera singer Dame Joan Sutherland, and former Prime Minister Gough Whitlam. In the case of cricketer Phillip Hughes, who died after being struck by a bouncer during a Sheffield Shield cricket match, the Australian flag was flown at half-mast at Cricket NSW headquarters on 27 November 2014 – the day of his death, as well as on the Sydney Harbour Bridge and at Lord's Cricket Ground in London. At times of natural disaster such as bushfires or tragedy. For example, in the days immediately following the Black Saturday bushfires, many flags of all types were flown at half-mast in spontaneous acknowledgement of the enormous loss of life; the then Prime Minister announced that the Australian Flag would be flown at half-mast on 7 February, in remembrance of the victims. On 19 July 2014, the Australian flag flew half-mast across the country in tribute to the lives lost in the Malaysia Airlines Flight 17 incident. On 16 December 2014, flags on all NSW government buildings, including the Sydney Harbour Bridge, flew at half-mast after the 2014 Sydney hostage crisis. On the death of international political friends to the country. Recent example includes Womtelo Reverend Baldwin Lonsdale, President of the Republic of Vanuatu. In Australia and other Commonwealth countries, merchant ships "dip" their ensigns to half-mast when passing an RAN vessel or a ship from the navy of any allied country. The flag of Bangladesh flew at half-mast on the national mourning day (15 August , the day in which Father of the nation Bangobandhu Sheikh Mujibor Rahman was brutally murdered with some of his family members by a group of derailed military Officers. The national flag is also kept half hoisted on 21 February which is recognised as International Mother’s Language Day to pay homage to the martyrs of Language Movement in 1952 which took place to establish ‘Bangla’ as the state Language of the then East Pakistan (Present Bangladesh). The flag of Cambodia flew at half mast upon the death of King-Father Norodom Sihanouk for 7 days, from 15–22 October 2012. The death of a police officer in the line of duty. The flag could be flown at half-mast from a couple of days to weeks, depending on the ranking of the officer. The flag of Canada, the flag of Québec, and the flag of the Royal Canadian Sea Cadets are half masted on board Bagotville Cadet Summer Training Centre, following the train detrailment and explosion of Lac Mégantic, Québec. There are, however, exceptions to the rules of half-masting in Canada: if Victoria Day or Canada Day fall during a period of half-masting, the flags are to be returned to full-mast for the duration of the day. The national flag on the Peace Tower is also hoisted to full mast if a foreign head of state or head of government is visiting the parliament. These exemptions, though, do not apply to the period of mourning for the death of a Canadian monarch. The Royal Standard of Canada also never flies at half-mast, as it is considered representative of the sovereign, who ascends to the throne automatically upon the death of his or her predecessor. Each province can make its own determination of when to fly the flag at half-mast when provincial leaders or honoured citizens pass away. To raise a flag in this position, the flag must be flown to the top of the pole first, then brought down halfway before the flag is secured for flying. When such mourning occurs, all flags should be flown at that position or not be flown at all, with the exception of flags permanently attached to poles. A controversy surfaced in April, 2006, when the newly elected Conservative government discontinued the practice, initiated by the previous Liberal government following the Tarnak Farm incident, of flying the flag at half-mast on all government buildings whenever a Canadian soldier was killed in action in Afghanistan. The issue divided veterans' groups and military families, some of whom supported the return to the original tradition of using Remembrance Day to honour all soldiers killed in action, while others felt it was an appropriate way to honour the fallen and to remind the population of the costs of war. In spite of the federal government's policy, local authorities have often decided to fly the flag at half-mast to honour fallen soldiers who were from their jurisdiction, including Toronto and Saskatchewan. On 2 April 2008, the House of Commons voted in favour of a motion calling on the government to reinstate the former policy regarding the half-masting of the flag on federal buildings. The motion, however, was not binding and the Cabinet refused to recommend any revision in policy to the Governor General. At the same time, a federal advisory committee tabled its report on the protocol of flying the national flag at half-mast, recommending that the Peace Tower flag remain at full height on days such as the Police Officers National Memorial Day and the National Day or Remembrance and Action on Violence Against Women, stating that the flag should only be half-masted on Remembrance Day. At last report, the committee's findings had been forwarded to the House of Commons all-party heritage committee for further study. Chinese flag at half-mast to mark to mourn for the victims of the 2008 Sichuan earthquake. On the death of the President, Premier, Chairman of the Standing Committee of the National People's Congress, Chairman of the Central Military Commission, Chairman of the Chinese People's Political Consultative Conference, and those who have made major contributions to the People's Republic of China, or to world peace or advancement of the mankind. For example, the flag was flown at half-mast after the deaths of Zhou Enlai (1976), Zhu De (1976), Mao Zedong (1976), Soong Ching-ling (1981), Hu Yaobang (1989), Li Xiannian (1992), Deng Xiaoping (1997) and Yang Shangkun (1998). When major disasters happen, such as when the flag was flown at half-mast from 19 May to 21 May 2008, the three national mourning days for the 2008 Sichuan earthquake. The Finnish flag flying at half-mast after the 2011 Norway attacks. In Finland, the official term for flying a flag at half-mast is known as suruliputus (mourning by flag(ging)). It is performed by raising the flag briefly to the top of the mast and lowering it approximately one-third of the length of the flagpole, placing the lower hoist corner at half-mast. On wall-mounted and roof-top flagpoles the middle of the flag should fly at the middle of the flagpole. When removing the flag from half-mast, it is briefly hoisted to the finial before lowering. 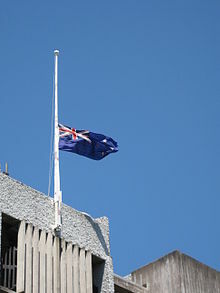 Traditionally, private residences and apartment houses fly the national flag at half-mast on the day of the death of a resident, when the flag is displayed at half-mast until sunset or 21:00, whichever comes first. Flags are also flown at half-mast on the day of the burial, with the exception that the flag is to be hoisted to the finial after the inhumation takes place. Flags are also to be flown at half-mast on the days of national mourning. 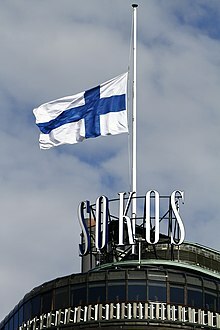 Such days are the deaths of former or current Finnish presidents, as well as significant catastrophic events such as the aftermath of 2004 Indian Ocean earthquake and tsunami, 2011 Norway attacks and significant national events such as the 2004 Konginkangas bus disaster and school shootings of Jokela and Kauhajoki. Historically, flags were flown at half-mast on the Commemoration Day of Fallen Soldiers which takes place on the third Sunday of May. Originally, flag was raised to the finial in the morning, displayed at half-mast from 10:00 to 14:00, and again raised to the finial for the rest of the day. In 1995, the 50th anniversary of the end of the Second World War, the tradition of flying the flag at half-mast was discontinued and flag is displayed at the finial in a usual manner. The French flag is flown half mast on any Day of Mourning by order of the government (for example after the Charlie Hebdo attack on 7 January 2015, the Paris attacks on 13 November 2015 and the Nice attack on 14 July 2016). Other countries have also flown the French flag at half mast because of this too. (Australia's Sydney Harbour Bridge flew the French flag at half mast because of the Paris attacks on 13 November 2015). Some occurrences of the French flag being flown half mast have been controversial, especially after the death of Pope John Paul II in 2005 but also in a lesser measure at the time following the death of Joseph Stalin in March 1953. On National Day of Mourning (33rd Sunday of Ordinary Time). On any day of mourning by order of the federal president for all of Germany, or by order of a minister president for a particular state. E.g. upon the death of a current or former ranking politician or person of high esteem, or multiple deaths in accidents or natural disasters. According to Law 851/1978, the only day specified on which the Greek flag is flown at half-mast is Good Friday. Also, on other national and public mourning days. Similar rules as in China apply for Hong Kong. See Flag of Hong Kong for details. Prior to the transfer of sovereignty in 1997, the rules for flying the flag at half-mast were the same as the British ones. The HKSAR flag was flown at half-mast on 24–26 August 2010, for the fatalities of the Hong Thai Travel tourists in the 2010 Manila hostage crisis. The national flag of the PRC was also flown at half-mast on 26 August in Hong Kong. The HKSAR flag was flown at half-mast on 4–6 October 2012, for the Lamma Ferry Accident victims in which 39 people died. The flag of India is flown at half-mast for the death of a President, Vice-President, or Prime Minister, all over India. For the Speaker of the Lok Sabha and the Chief Justice of The Supreme Court of India, it is flown in Delhi and for a Union Cabinet Minister it is flown in Delhi and the state capitals, from where he or she came. For a Minister of State, it is flown only in Delhi. For a Governor, Lt. Governor, or Chief Minister of a state or union territory, it is flown in the concerned state. If the intimation of the death of any dignitary is received in the afternoon, the flag shall be flown at halfmast on the following day also at the place or places indicated above, provided the funeral has not taken place before sunrise on that day. On the day of the funeral of a dignitary mentioned above, the flag shall be flown at half-mast at the place of the funeral. For example, on 17 March 2019, The Government of India declared a National Day of mourning on 18 March 2019 due to the sad demise of the Chief Minister of Goa, Mr. Manohar Parrekar on 17 March 2019. This means, that on 18 March 2019, the Indian National Flag must be half-masted in the National Capital i.e. New Delhi and in the capital cities of all the 29 states and Union Territories. In the event of a halfmast day coinciding with the Republic Day, Independence Day,National Week (6 to 13 April), any other particular day of national rejoicing as may be specified by the Government of India, or, in the case of a state, on the anniversary of formation of that state, flags are not permitted to be flown at half-mast except over the building where the body of the deceased is lying until it has been removed and that flag shall be raised to the full-mast position after the body has been removed. Observances of State mourning on the death of foreign dignitaries are governed by special instructions issued from the Ministry of Home Affairs (Home Ministry) in individual cases. However, in the event of death of either the Head of the State or Head of the Government of a foreign country, the Indian Mission accredited to that country may fly the national flag on the above-mentioned days. India observed a five-day period of National Mourning on the death of Nelson Mandela in 2013. India also declared 29 March 2015 as a day of National Mourning as a mark of respect to the former Prime Minister of Singapore, Lee Kuan Yew. The flag of Iran is flown at half-mast on the death of a national figure or mourning days. The flag of Ireland is flown at half-mast on the death of a national or international figure, that is, former and current Presidents or Taoiseach, on all prominent government buildings equipped with a flag pole. The death of a prominent local figure can also be marked locally by the flag being flown at half-mast. When the national flag is flown at half-mast, no other flag should be half-masted. When a balcony in Berkeley, California, collapsed, killing six Irish people, flags were flown at half mast above all state buildings. On other national days of mourning. The flag of Italy was flown at half-mast after the 2013 Sardinia floods on 22 November 2013. On 12 October remembering the 2002 Bali bombings. On 26 December remembering the 2004 Indian Ocean earthquake and tsunami in Aceh. On 30 September remembering the 30 September Movement. After the death of the president / vice president / former president or other great figures who have great influence for the region / country. For example: the Indonesian flag was raised half-mast for a week after Sukarno, Suharto and Abdurrahman Wahid's death. The flag of Japan is flown at half-staff upon the death of the Emperor of Japan, other members of the Imperial Family, or a current or former Prime Minister, and also following national disasters such as the 2011 Tōhoku earthquake and tsunami. In addition to the tradition of half-staff, the national flag topped by black cloth may be flown to designate mourning. See the flag of Japan for more. When the Prime Minister's Department orders to flown the Malaysian flag at half-mast for some days. As a mark of respect to the passengers and crew who were on board Malaysia Airlines Flight 370 and their family members, some states had their states flag flown at half-mast. Similarly, as a mark of respect to the passengers and crew who were on board Malaysia Airlines Flight 17 and their family members, the national flag was flown at half-mast for three days and also on the national day of mourning, 22 August 2014. The 2015 Sabah earthquake had a mourning day and the flag half-mast on 8 June 2015. The flag of Malta is flown at half-mast on government buildings by instruction of the government through the Office of the Prime Minister, for example after 2004 Indian Ocean earthquake and tsunami. By instruction of the Dutch government through the office of the Prime Minister in special situations, such as happened after the crash of Malaysia Airlines Flight 17 in which 193 Dutch citizens died and the 2009 attack on the Dutch royal family on 30 April, Koninginnedag, which resulted in the deaths of seven by-standers. The royal standard and other flags of the Dutch royal family are never flown at half-mast. Instead, a black pennon may be affixed to the flag in times of mourning. According to the Ministry of Culture and Heritage, the position is always referred to as half-mast. The flag should be at least its own height from the top of the flagpole, though the actual position will depend on the size of the flag and the length of the flagpole. On 16 October, anniversary of the death of the first Prime Minister, Liaquat Ali Khan (1952). Any other day notified by the Government. For example, on the death of Saudi king King Fahd bin Abdul Aziz, the flag was flown at half-mast for seven days (the flag of Saudi Arabia wasn't at half-mast because the flag contains the Shahada). Upon the Assassination of Benazir Bhutto, the flag was ordered to be flown at half-mast for three days. On the death of Syedna Mohammed Burhanuddin, spiritual leader of Dawoodi Bohra community, the flag has been ordered by Sindh Chief Minister Qaim Ali Shah, to be flown at half-mast for two days (17 and 18 January) to express solidarity with the bereaved community. In 2014, Prime Minister Nawaz Sharif announced a three-day mourning period from 16 December, including flying the flag at half-mast nationwide and at all Embassies and High Commissions of Pakistan, for the attack on Army Public School in Peshawar. The flag of the Philippines may be flown at half-mast as a sign of mourning. Upon the official announcement of the death of the President or a former President, the flag should be flown at half-mast for ten days. The flag should be flown at half-mast for seven days following the death of the Vice President, the Chief Justice, the President of the Senate or the Speaker of the House of Representatives. The flag may also be required to fly at half-mast upon the death of other persons to be determined by the National Historical Institute, for a period less than seven days. The flag shall be flown at half-mast on all the buildings and places where the decedent was holding office, on the day of death until the day of interment of an incumbent member of the Supreme Court, the Cabinet, the Senate or the House of Representatives, and such other persons as may be determined by the National Historical Institute. Such other people determined by the National Historical Institute have included Pope John Paul II, and former U.S. President Ronald Reagan. As per Republic Act No. 229, flags nationwide are flown at half-mast every Rizal Day on December 30 to commemorate the death of national hero José Rizal. When flown at half-mast, the flag should be first hoisted to the peak for a moment then lowered to the half-mast position. It should be raised to the peak again before it is lowered for the day. The flag may also be used to cover the caskets of the dead of the military, veterans of previous wars, national artists, and outstanding civilians as determined by the local government. In such cases, the flag must be placed such that the white triangle is at the head and the blue portion covers the right side of the casket. The flag should not be lowered to the grave or allowed to touch the ground, but should be solemnly folded and handed to the heirs of the deceased. Flags must also be raised to half-mast immediately in any area recovering from natural disasters such as a typhoon or an earthquake. On 22 June as a reminder of the Nazi invasion of the USSR in 1941. On the death of a current or former President of Russia. On disasters causing more than 100 killed – across all the country upon Presidential proclamation. On disasters causing more than 10 killed – in a suffering region upon proclamation of a Governor. On other tragic occasions. For example, national mourning was proclaimed and all the state flags were flown at half-mast after the Polish President's plane crash near Smolensk, Russia despite the number of casualties being slightly fewer than 100. After the Assassination of Andrei Karlov, the Russian ambassador in Turkey, in December 2016, the Russian flag was flown in half-mast on all Russian embassies in the world. All the regional flags and the departmental ensigns are flown at half-mast on national or regional mourning days as well as the national flag. Firms and non-governmental organizations, embassies and representatives of international organizations often join the mourning. National or regional mourning usually lasts for one day. The flag of Saudi Arabia is never flown at half-mast. The flag of Saudi Arabia is one of the four flags in the world that are never flown at half-mast because it shows the Shahada. The flag of Somaliland, a self-declared state internationally recognized as part of Somalia, also displays the Shahada. The flag of Iraq bears the Takbir once. The flag of Afghanistan displays the Takbir beneath the Shahada on the top. Since all four bear the concept of oneness of God, the flags are never lowered to half-mast even as a sign of mourning. The flag of South Africa is flown at half-mast as a sign of mourning when ordered by the President of South Africa. Upon the official announcement of the death of the current or former President, the flag should be flown at half-mast for ten days. The flag should be flown at half-mast for seven days following the death of the Deputy President, the Chairperson of NCOP, the Speaker of the National Assembly or the Chief Justice. For example, the flag was flown at half-mast from 6–15 December 2013 during the national mourning period for Nelson Mandela. The flag was flown at half-mast during the week of national mourning following the Marikana massacre in August 2012. The flag of South Korea (Taegeukgi) is flown at half-mast on Hyeonchungil (Korean Memorial Day). The flag of Sri Lanka is nationally flown at half-mast on a National day of mourning. On the death of a current or former King of Sweden. The flag of the Republic of China is flown at half-mast on 28 February to mark the anniversary of the 28 February Incident. On 5 August 2014, Taiwan flew their flag in half-mast for three days to commemorate the victims of the Kaohsiung gas explosions and TransAsia Airways Flight 222 crash. The flag of Thailand was flown at half-staff for 15 days to mourn for the victims of 2004 Indian Ocean earthquake and tsunami. The flag of Thailand was flown at half-staff from 2 January to 15 January 2008 on the death of Princess Galyani Vadhana, the Princess of Naradhiwas. Also from 14 October to 13 November 2016 the flag of Thailand was flown half-staff for 30 days; following the death of King Bhumibol Adulyadej (Rama IX). The flag of Turkey is flown at half-mast throughout Turkey every 10 November, between 09:05 and the sunset, in memory of Mustafa Kemal Atatürk, who died on 10 November 1938 at five past nine in the morning. At other times, the government may issue an order for the national flag to be flown at half-mast upon the death of principal figures of the Turkish political life as a mark of respect to their memory (such as Turgut Özal). When such an order is issued, all government buildings, offices, public schools and military bases are to fly their flags at half-mast. To show the sympathy of Turkish people to a foreign leader, flags are also flown at half-mast by governmental order (such as after the deaths of Yasser Arafat or Pope John Paul II). The flag at the Grand National Assembly in Ankara is never lowered to half-mast, regardless of the occasion. The flag at Anıtkabir, the mausoleum of Mustafa Kemal Atatürk, the founder of Turkey, is only lowered to half-mast on November 10. At those times when the flag is to be flown at half-mast, it must first be raised to full height, then lowered to half-mast. The flag of the United Arab Emirates is flown at half staff on 30 November (Martyrs' Day) of every year from 08:00 to 11:30. The flag is also flown at half staff by decree of the President of the United Arab Emirates usually for three days. Each of the seven Emirs has the right to order flags to be flown at half staff in his Emirate. Oratory Church of St Aloysius Gonzaga, Oxford, with the flag of the Holy See flying at half-mast the day after the death of Pope John Paul II. The Royal Standard, the flag of the British monarch, is never flown at half-mast, because there is always a living monarch: the throne passes immediately to the successor. There was some controversy in the United Kingdom in 1997 following the death of Diana, Princess of Wales that no flag was flying at half-mast at Buckingham Palace. Until 1997, the only flag to fly from Buckingham Palace was the Royal Standard, the official flag of the reigning British sovereign, which would only fly when the sovereign was in residence at the Palace (or, exceptionally, after the death of the sovereign, the flag of the next senior member of the Royal Family would be raised, if the new sovereign were not present); otherwise, no flag would fly. In response to public outcry that the palace was not flying a flag at half mast, Queen Elizabeth II ordered a break with protocol, replacing the Royal Standard with the Union Flag at half-mast as soon as the Queen left the Palace to attend the Princess's funeral at Westminster Abbey. The Royal Standard was again flown (at full hoist) on her return to the Palace. Since then, the Union Flag flies from the Palace when the Queen is not in residence, and has flown at half mast upon the deaths of members of the Royal Family, such as Princess Margaret and the Queen Mother in 2002 and other times of national mourning such as following the terrorist bombings in London on 7 July 2005. Other occasions, by special command of the Sovereign. According to the Department of Culture, Media and Sport, the correct term is Half Mast. If a flag flying day coincides with a half-mast flag flying day (including the death of a member of the royal family), the flag is flown at full-mast unless a specific command is received from the Sovereign. If more than one flag is flown on a half-mast day, they must all be flown at half-mast, or not at all. The flag of a foreign nation must never be flown at half-mast on UK soil unless that country has declared mourning. At the United Nations offices in New York and Geneva, the flag of the United Nations flies at half-staff on the day after the death of a Head of State or a Head of Government of a member state, but generally not during the funeral. Other occasions are at the Secretary-General's discretion. Other offices may follow local practice. To honor the memory of Dag Hammarskjöld the UN issued postage stamps showing its flag at half-staff. The United States flag flying at half-staff at sunset. In the United States, the usual government term for non-nautical use is "half-staff." While the term "half-mast" is commonly used in place of half-staff, U.S. law and post-WW-I military tradition indicate that "half-mast" is reserved to usage aboard a ship, where flags are typically flown from masts, and at naval ships ashore. In the United States, the President can issue an executive order for the flag of the United States to be flown at half-staff upon the death of principal figures of the United States government and others, as a mark of respect to their memory. When such an order is issued, all government buildings, offices, public schools, and military bases are to fly their flags at half-staff. Under federal law (4 U.S.C. § 7(f)), the flags of states, cities, localities, and pennants of societies, shall never be placed above the flag of the United States; thus, all other flags also fly at half-staff when the U.S. flag has been ordered to fly at half-staff. There is no penalty for failure to comply with the above law as to enforce such a penalty would violate the First Amendment. Governors of U.S. states and territories are authorized by federal law to order all U.S. and state flags in their jurisdiction flown at half-staff as a mark of respect for a former or current state official who has died, or for a member of the armed forces who has died in active duty. The governor's authority to issue the order is more restricted than the president's, and does not include discretion to issue the order for state residents who do not meet the criteria stated. Since a governor's executive order affects only his or her state, not the entire country, these orders are distinguished from presidential proclamations. For thirty days after the death of a current or former president or president-elect. For ten days after the death of a current vice president, current or retired chief justice, or current Speaker of the House of Representatives. From the day of death until interment of an Associate Justice of the Supreme Court, a secretary of an executive or military department, a former vice president, the President Pro Tempore of the Senate, or the governor of a state, territory, or possession. On the day of death and the day after for a Member of Congress. On Memorial Day until noon. Every September 11 in remembrance of the September 11 attacks. Upon presidential proclamation, usually after the death of other notable figures or tragic events. Federal law includes a Congressional request that the flag be flown at half-staff on Peace Officers Memorial Day (May 15), unless that day is also Armed Forces Day. Presidential proclamations also call for the flag to be flown at half-staff on Pearl Harbor Remembrance Day (December 7), and Patriot Day (September 11). On October 16, 2001, President George W. Bush approved legislation requiring the United States flag to be lowered to half-staff on all Federal buildings to memorialize fallen firefighters. Pub.L. 107–51 requires this action to occur annually in conjunction with observance of the National Fallen Firefighters Memorial Service. The date of the National Fallen Firefighters Memorial Service is traditionally the first Sunday in October. It is held at the National Fallen Firefighters Memorial in Emmitsburg, Maryland. 4 U.S.C. § 7(m) was modified with new legislation signed into effect on June 29, 2007, by President Bush, requiring any federal facility within a region, which proclaims half-staff to honor a member of the U.S. Armed Forces who died on active duty, to follow the half-staff proclamation. Apart from the lowered position of the flag of Vietnam, state mourning also warrants a black ribbon 1/10 the width of the flag's width and equal to the length of the flag to be tied at the summit. Variants have the black ribbon wrapped around the flag itself, preventing it from being unfurled. The flag of Zimbabwe is flown at half-staff at the conferment of National Hero Status to the deceased. As a first-generation[discuss] republic, adjudication over such a status is currently done by the politburo of the ZANU–PF. ^ "Flags at half mast". ^ "Half-Staff versus Half-Mast: Which is correct?". CollinsFlags.com. Retrieved 2017-05-29. ^ Trex, Ethan (20 December 2012). "Why are flags flown at half-staff in times of mourning?". The Week. Retrieved 22 June 2015. ^ Bartram, G., A Guide to Flag Protocol in the United Kingdom Archived 2013-08-11 at the Wayback Machine, an extract from the book British Flags and Emblems", The Flag Institute. ^ "What is the proper etiquette for lowering the flag to half staff?". The Flag Shop. Retrieved 2017-05-29. ^ a b "Basic Flag Protocol and Etiquette". Newton Newton Flag & Banner Makers Limited. Retrieved 2017-05-29. ^ "Flags at half-staff". The Flag Institute. ^ FitzSimons, Peter. "There is a way Phillip Hughes' proud legacy can live on". Retrieved 28 November 2014. ^ Knox, Malcolm (28 November 2014). "Phillip Hughes a cut above the rest". The Sydney Morning Herald. Retrieved 28 November 2014. ^ "Phillip Hughes: Tributes flow from international community as flags fly at half-mast at Lord's" (ABC News). 28 November 2014. Retrieved 1 December 2014. ^ "MH17: Australian flags to be flown at half-mast as nation mourns victims". 19 July 2014. ^ Hasham, Nicole (16 December 2014). "Sydney siege ends: flags to fly at half mast and floral tributes at Martin Place". The Sydney Morning Herald. Retrieved 17 December 2014. ^ Remeikis, Amy (16 December 2014). "Flags fly at half mast in Queensland to honour Sydney siege victims". The Sydney Morning Herald. Retrieved 17 December 2014. ^ "Why are the flags on the Harbour Bridge half-mast?". ^ "Rules for Half-masting the National Flag of Canada". Department of Canadian Heritage. Retrieved 2008-03-31. ^ "Flags at Half Mast Everywhere and Amusement Places Closed". The New York Times. 1901-01-23. Retrieved 2008-03-31. ^ a b "Conservatives decide not to lower the Canadian flag to fly the flag at half-mast every time a Canadian soldier is killed". CBC. 2006-04-01. Archived from the original on 2011-01-20. Retrieved 2008-03-31. ^ "Peace Tower flag will not be lowered for military deaths". CBC. 2006-04-24. Archived from the original on 2008-06-06. Retrieved 2008-03-25. ^ "Sask. flags at half-mast for fallen soldier". CBC. 2006-08-09. Archived from the original on 2009-05-08. Retrieved 2008-03-25. ^ Greenaway, Norma (2008-04-02). "Conservatives lose flag vote". CanWest Global Communications. Archived from the original on 2008-06-18. Retrieved 2008-04-13. ^ Channel, Government of Canada, Service Canada, Citizen Service Branch, Digital Service Directorate, Web; Web, Gouvernement du Canada, Service Canada, Direction générale de service aux citoyens, La Direction du service numérique, Services. "Canada.ca". www.canadianheritage.gc.ca. ^ "Drapeaux en berne et le deuil du pape". Le Monde.fr. ^ "Drapeaux en berne : un honneur rare pour une personnalité étrangère". 6 December 2013. ^ "5-day state mourning in India as a mark of respect to Nelson Mandela – The Times of India". The Times Of India. ^ "Flag of Iran is flown half-mast". Retrieved 2017-01-21. ^ "Holidays — Holocaust Remembrance Day". Retrieved 2010-10-23. ^ "Memorial Day Law for the Fallen of Israel's Wars (unofficial translation)". Retrieved 2010-10-23. ^ "It falls under their prerogative, says government official – Nation – The Star Online". ^ migration (18 July 2014). "Malaysia Airlines MH17 crash: Flags to fly at half-mast over next three days, says Najib". ^ "Flags, Symbols and their uses". Government of Malta. Archived from the original on 29 June 2015. Retrieved 4 April 2015. ^ "Flags at half mast". Times of Malta. 1 January 2005. Retrieved 4 April 2015. ^ Koninkrijksrelaties, Ministerie van Binnenlandse Zaken en. "Ministerie van Binnenlandse Zaken en Koninkrijksrelaties". ^ "Personal flags". www.royal-house.nl. Retrieved 26 August 2017. ^ "The royal standard of King Willem-Alexander flies with a mourning..." Getty Images. Retrieved 26 August 2017. ^ a b "Flying the New Zealand flag". ^ "Sir Edmund Hillary dies". 12 January 2008. Archived from the original on 16 January 2008. Retrieved 2008-01-16. ^ "Half-masting of New Zealand flag". Archived from the original on 2009-08-07. Retrieved 2008-01-16. ^ "At least 141 dead in Taliban school attack in PeshawarARY NEWS". ^ "Republic Act No. 8491". Archived from the original on 2007-12-05. Retrieved 2009-06-08. (archived from the original on 2007-12-05). ^ "Singapore's Government extends condolences after death of PAP pioneer Jek Yeun Thong". channelnewsasia.com. June 6, 2018. Retrieved 2018-06-06. ^ "Government Notice: Instructions regarding the flying of the national flag of South Africa". Government of South Africa. 8 June 2001. Archived from the original on 3 September 2013. Retrieved 16 December 2013. ^ "Nelson Mandela dead: Full address to the nation by President Jacob Zuma". The Independent. London. 5 December 2013. Retrieved 15 December 2013. ^ "Flags to fly at half mast for a week". The Mercury. 20 August 2012. Retrieved 16 December 2013. ^ "Flags flying at half-mast to mourn explosions, air crash". The China Post. 6 August 2014. Retrieved 28 November 2014. ^ Pierce, Andrew (August 18, 2007). "Royal Family learnt lesson over Princess Diana". The Daily Telegraph. London. Retrieved 2012-03-18. ^ "Flying Flags in the United Kingdom - A Guide to Britain's Flag Protocol" (PDF). Flag Institute. The Flag Institute/The Flags & Heraldry Committee. Retrieved 14 March 2018. ^ "Bartleby.com: Great Books Online -- Quotes, Poems, Novels, Classics and hundreds more". Archived from the original on 2008-05-10. ^ "Does a Flag Fly at Half-Staff or Half-Mast? USA Flag Site". Archived from the original on 2015-03-16. Retrieved 2008-05-26. ^ "Nixon's Proclamation 3948 establishing the expectation that the flag will be raised to half-mast upon the death of certain designated officials". presidency.ucsb.edu. Retrieved 2012-12-20. ^ "Flying the American Flag at Half Staff" (PDF). Veterans Affairs. ^ "Honoring the Victims of the Incidents on Tuesday, September 11, 2001" (Press release). White House. September 12, 2001. Retrieved 2008-01-16. ^ "Flying the American Flag at Half Staff" (PDF). U.S. Department of Veterans Affairs. Retrieved 12 June 2016. ^ "National Pearl Harbor Remembrance Day, 2007" (Press release). White House. December 4, 2007. Retrieved 2008-01-16. ^ "Patriot Day, 2007" (Press release). White House. September 4, 2007. Retrieved 2008-01-16. ^ "National Fallen Firefighters Memorial Service". The Library of Congress. October 16, 2001. Retrieved 2010-05-06. ^ "National Fallen Firefighters Monument". National Fallen Firefighters Foundation. October 1, 1981. Retrieved 2010-05-06. ^ "Code Modifications for Half-Staff at a Federal Facility". "When to fly the flag at half mast", gettysburgflag.com. Retrieved 2009-01-04. ^ giaoduc.net.vn (6 October 2013). "Cách treo cờ rủ Lễ tang Đại Tướng Võ Nguyên Giáp". 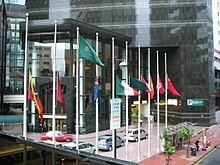 Wikimedia Commons has media related to Flags at half staff. Look up half-mast or half-staff in Wiktionary, the free dictionary. This page was last edited on 10 April 2019, at 20:33 (UTC).